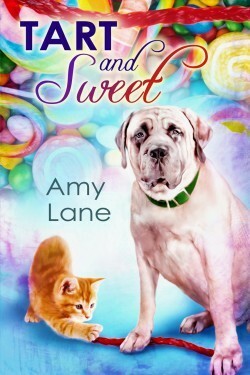 This is the fourth (and, I suspect, the last) book in Amy Lane's fabulous Candy Man series. I fell in love with Adam and Finn in book 1 and didn't want anyone to spoil their happy. When Robbie, Adam's ex (The One Who Broke Adam's Heart), becomes Finn's unlikely hero, no one is more surprised than Robbie. Because Robbie lives and breathes regret. He's sorry about being a coward. Sorry for not standing up to his racist, homophobic parents. Sorry for living a lie. And especially sorry for turning his back on Adam when Adam needed him most. Except Robbie isn't a bad guy. He's just the guy who takes the easy way out. Until he meets Cyril. Cy is graceful and doesn't live in shame. He's unabashedly bi and femme. He's a dancer and dance teacher who busses at a nightclub on the side (passion doesn't always pay the bills). And he's willing to give Robbie a chance, willing to forgive—even when Robbie can't forgive himself. This book has many elements that make Amy Lane one of my favorite authors in the genre: strong writing; witty dialogue; complex characters; a sense of community (all the guys from the previous books play at least a small role in Tart and Sweet, so do NOT attempt to read as a standalone); humor; plenty of hot & steamy; and a HEA. But something was amiss here, and I'm having a hard time putting my finger on what specifically bothered me. For one, I didn't like the way Cy's character was portrayed at the beginning: grooving on the street, not a care in the world. Cy talks a little jive and moves his hips like he was born to it. This felt ... well, stereotypical. Robbie's parents are bigots (but NICE bigots, the ones who don't mind black people but think they all look alike; you know the kind). Fortunately, we get a glimpse of Robbie's parents in chapter 1 and don't see them again until the end, when Robbie's mom at least attempts to be good, and Finn orders cheesecake. Because cheesecake solves all problems. I loved Robbie, and I loved Cy, but I didn't necessarily love them together. I wanted to believe in them as a couple, the way I believe in Adam and Finn, or Ezra and Miguel. But I wasn't feeling it, not entirely anyway. Even so, I enjoyed the story. I liked the friendship and the cats, and Adam and Finn's bigass dog. I liked Robbie's friends from work and the way Cy trusted Robbie not to break his heart. The epilogue was a nice touch. We can all breathe easy now, because these men will be okay. Pixy Stix never lie.